New polls put the Libertarian Party's nominee, Gary Johnson, at unprecedented heights. While it isn't enough to put him in contention, his share of the vote could have a decisive impact on the campaigns of Hillary Clinton and Donald Trump. But who stands to be hurt the most? There's one name that you might begin to hear more and more as voting day approaches in the U.S. presidential election: Gary Johnson. But who is Gary Johnson, you ask? Over two-thirds of Americans are wondering the same thing. He is the former governor of New Mexico and he is running as the Libertarian Party's presidential nominee for the second consecutive election. He's also one of the most unpredictable factors in what has been an unpredictable American campaign. U.S. politics are rarely kind to third-party candidacies. Both the political system and media coverage is designed for two parties. And in order to get into the debates, a third party candidate needs to be polling at 15 per cent. That is a threshold that is within Gary Johnson's reach. 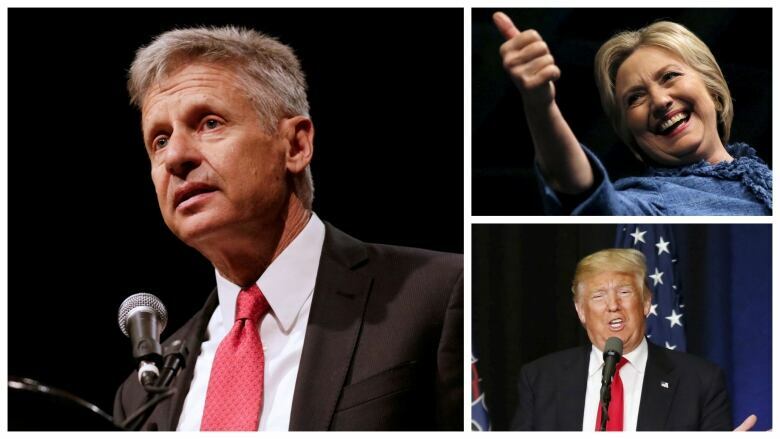 According to a poll from CNN/ORC published Sunday, the Libertarian nominee currently stands at 13 per cent support, the highest that Johnson has scored in any poll. Other recent polls from CBS News/New York Times, Morning Consult, and NBC News/Wall Street Journal have put Johnson at 11 or 12 per cent. These are not the numbers that are always reported in the headlines. Pollsters are increasingly asking two sets of questions: the more frequently reported gives respondents the opportunity to choose or volunteer "other" in addition to Trump and Clinton, while the second adds Johnson (and sometimes the Green Party's Jill Stein). But Johnson has been scoring very high for a third-party candidate in polls when his name has been included. He has averaged nine per cent support in polls conducted in July. His support has registered in the double-digits in about half of those polls. Including Johnson, Stein, and other candidates, a third option is currently averaging 14 per cent support in the CBC's weighted average of U.S. polls. This would mark the best performance of third party candidates since 1992, when Ross Perot — running on a ticket of reducing the national debt — took just under 19 per cent of the vote. That was the best performance by any third party candidate since 1912, when Theodore Roosevelt ran for president as the Progressive Party's nominee. Even in the 2000 election, when Ralph Nader took enough votes away from the Democrats' Al Gore to arguably hand the election to George W. Bush, third party candidates took just under 4 per cent of the vote. So if Johnson captures anything close to his current polling levels, it would be historically significant. But could he play the same spoiler role as Nader did in 2000? Does Johnson hurt Clinton or Trump? Johnson, who was a businessman before entering politics, is a fiscal conservative who, as governor of New Mexico from 1995 to 2003, instituted a small government platform and campaigned for marijuana legalization. A strong campaign from Johnson should, on paper, have a greater impact on Donald Trump, the presumptive Republican nominee. 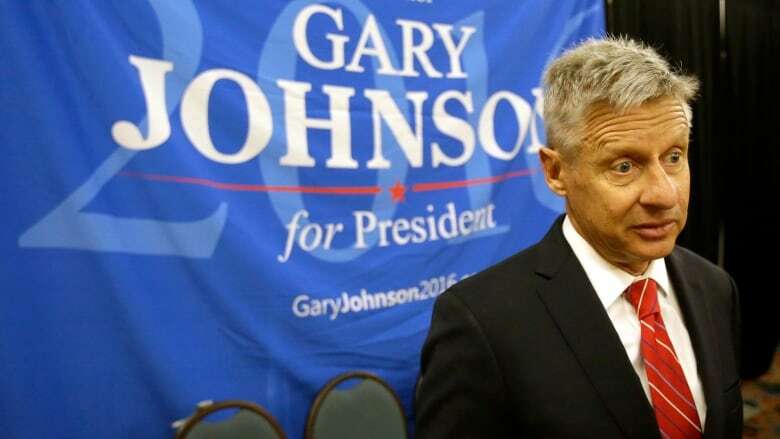 The Libertarian Party is further to the right than the Republicans on many political issues, and Johnson was a Republican before crossing over to the Libertarians in 2011. His running mate, William Weld, is also a former Republican governor. Both Mitt Romney and Jeb Bush have publicly mused about voting for Johnson. But some of the Libertarian Party's socially liberal policies also overlap with those of the left. This might make Johnson an interesting option for disillusioned supporters of Bernie Sanders. The polls bear this out to some extent. The CNN/ORC poll put Johnson's support among Sanders primary voters at 23 per cent and among those who identify as Democrats at six per cent — no different than among those who identify as Republicans. At this stage, though, it appears to be a bit of a wash. Some polls, such as one from Franklin Pierce University, show Johnson taking slightly more support (five per cent) away from Republicans as from Democrats (three per cent). An ABC News/Washington Post poll shows the same (eight per cent among Republicans, two per cent among Democrats). Johnson scores much better among independents. Nevertheless, Johnson drawing any support away from the Democrats is problematic for Clinton even if he attracts more Republicans to his side. The Greens' Jill Stein draws disproportionately enough from the Democrats to make up the difference. The biggest question for Gary Johnson, however, is whether he can actually deliver on his current levels of support. When Johnson last ran on the Libertarian ticket in 2012 he took just one per cent of the vote. Johnson remains largely unknown. The Franklin Pierce University poll shows that 47 per cent of Americans have never heard of Johnson, while another 27 per cent had heard of him but not enough to form an opinion. He is almost certain to under-perform his polls. The Libertarians do not get the media attention or fundraising needed to mount a campaign on par with those of the two big parties. In the final CNN/ORC poll of 2012, Johnson scored two per cent — twice what he actually received. But Johnson does seem to be on track to do much better than in 2012. Polling on Johnson was thin in that election cycle, but when his name was included in surveys during the summer he usually scored between three and five per cent. He's doing better than that now, and support for alternative options in general is higher than it was at this time four years ago. A Fox News poll in July 2012 put support for "others" at two per cent. The last poll from Fox News in this news cycle put it at seven per cent. Granted, these are not election-winning numbers. The likelihood of Johnson taking even a single electoral college vote is slim. But with Hillary Clinton's lead over Donald Trump currently standing at about four points, Johnson's share of the vote could play a decisive role in the outcome.